Perhaps no other animal symbolizes the West as dramatically as the American Bison. Bison are part of the family Bovidae, to which Asian buffalo, African buffalo and domestic cattle and goats belong. Because American bison resembled in some ways old world buffalo (Asian and African buffalo), early explorers to North America began to call them buffalo. Athough it is a misnomer, the name buffalo is still used interchangeably with bison. One of the physical differences between the old world buffalo and the American bison is the large shoulder hump of the bison. This hump, along with a broad, massive head, short thick neck and small hindquarters give the animal its rugged appearance. 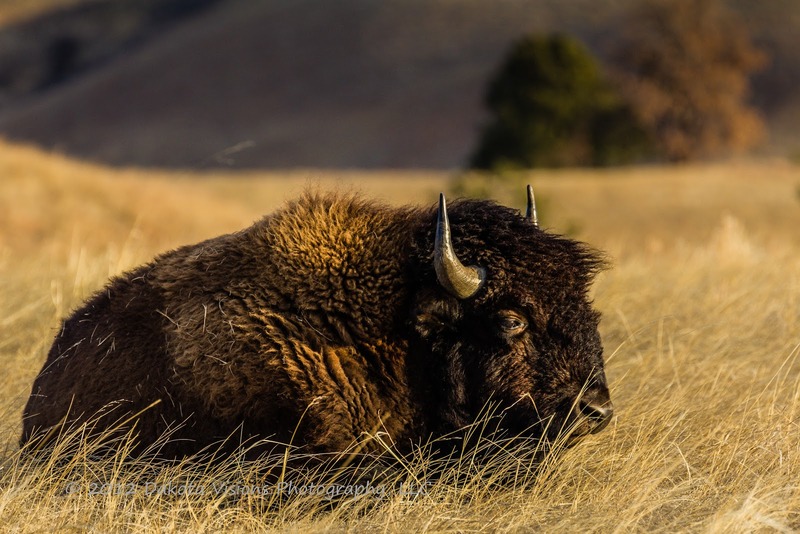 As you can note in the photograph above, the color and character of the bison's fur varies with the season. A mature bull in winter has a dark brown to black coat. The length of the hair measures up to sixteen inches on the forehead, ten inches on the forelegs, and only eight inches on the hindquarters. It is little wonder that bison, unlike domestic cattle, face into storms.